Nearly a month ago (has it been that long already?) I packed up my life and put it in a new-to-me car and set out for the Southwest, my long-lost home: Texas. Having been born in Houston, I grew up in Ft. Worth, went to Southern Methodist University then high-tailed it to NYC…then Los Angeles…then London…then back to LA. Then, not having had enough of the rat race and deafening 79th street subway stop, I returned to NYC. I’m glad I went back to New York because that is where I discovered, in the midst of a long spaghetti bowl of an acting career, Music Together. My journey to NYC the second time around was transformative. But home called. So after fighting that call for a couple of years I decided to heed it. I drove myself across the country to my new city, Austin (where else? ), to the open arms of Carey Youngblood and family at Heartsong Music where I would continue and hopefully enhance my journey as Early Childhood Music Educator. Though, I prefer the title Joyful Noise Maker. I arrived on a Monday and was shot out of cannon beginning demos the next three days. It was good not to have time to think about the transition. Meeting so many bright new faces, remembering new names, and learning the day to day ins and outs in a new home kept my mind occupied to say the least. But then came week three. The week I will call the “Oh, $%! *, what have I done” week. You know, the moment when the big change stares you head on in the mirror. The moment when all your little coping defenses leave you somewhere between now solidly knowing the location of Whole Foods and asking the same mom what her name is for the third time…in the same 45 minutes session. This, my new friends, is where I entered what I call The Vulnerability Shuffle (TVS). And guess what hits and cracks open our hearts and minds more acutely, profoundly and head on than any word, billboard, or chocolate bar? Yep. You know what I mean. Think about it. Think about that time you were feeling on edge, on shaky ground trying to contain your composure and then you heard that song on Pandora or Songza without warning. Now what if in the middle of that Vulnerability Shuffle, you had to sing that song or any song… while being asked what sound a giraffe makes? And while you are thinking perhaps for the first time that you do not know what a giraffe sounds like, that you forgot to pay the utility bill, and that your dad always told you were tone-deaf, you remember you are in a room full of other human beings…who may or may not…you think… be judging you? Perhaps at this moment you feel it would be easier to be flattened with the nearest steam roller. This depends, of course, on the shakiness of your particular and personal vulnerability but read on before your mind unravels! The good news is that though you may feel this at times going into your Music Together class, your child probably isn’t feeling it (TVS) to that “adult” degree. But hang with me a minute because the TVS is still there in the air for different reasons for them. You may have heard your teacher say this before: You are the most important person to your child. You are IT. You are THE THING, WHERE IT’S AT, THE MOTHERSHIP (pun intended). What you do, say, and sing means the world to her. He’s got his eye and awareness on you all the time. When you sing, she sings. When you dance, he dances. When you wiggle… you get the idea. And when you shut down, whether in heart, mind, or wiggles… guess what? The little duckling follows Mama Duck to jump ship. It takes a bucket load of courage and chutzpah to sing, wiggle, fly, strut, moo like a cow, and even show up to class. It may not be so hard in front of your kid on your own time, but, let’s face it; we are all in front of our peers. That’s where this glorious Music Together Family swoops in to sweep those fears away. We aren’t peers anymore in that room. Case in point: This morning I co-taught with our illustrious director, Carey Youngblood, at the Unity Church this morning. We decided that today Carey would teach and I’d get to play along with the family and observe her style. All teachers and directors are trained in the same way but the loveliness of this musical program is that it nurtures and encourages the educators to bring in and use their own style, creative ideas, and uniqueness to their own classes. We often “steal and share” from each other. So whereas we are all singing the “Hello Song” all over the world, in Texas while singing Hello to our noses and toeses, in New York we may be babbling and drumming on our guitars. In Italy I know for a fact they are using those jingle bells…yes, in the “Hello Song”. I returned puffy eyed after the “Goodbye, So Long Farewell” song was over feeling thoroughly humiliated. There was no hiding it. I slinked back in reeling from silent embarrassment with a secret futile hope that no one would notice my red nose. I felt ridiculous, stupid, unprofessional, shuffling off to Vulnerable all the way. Yes! I did the thing I don’t want you to do. I ran! Then a crazy thing happened. Carey gave me a long, warm hug. Actually, that part is not so crazy. If you know Carey, you probably know her hugs, too. But then the next wonderful thing happened: a mom hugged me. Then another mom hugged me. Then another. Then one of the toddlers walked up and kissed me on the cheek. I may have felt all those nutty things but the noise was silenced by the love and acceptance in the room. You are who I am talking about. Why am I vomiting this to You who barely know me? Because You, for your own important and meaningful real reasons, may feel this way in class one day (if not already) as well. Your child, in varying stages of development, will have moments of vulnerability, too. They are our little human beans with thoughts, emotions and needs for their own comfy cozy ways of doing things. But I firmly believe this is our strength to come together in this midst of all this…this… stuff and sing ANYWAY! Our children do not know it’s scary to sing and dance in front of each other. Only we can model that kind of fear. See you in the circle of love. 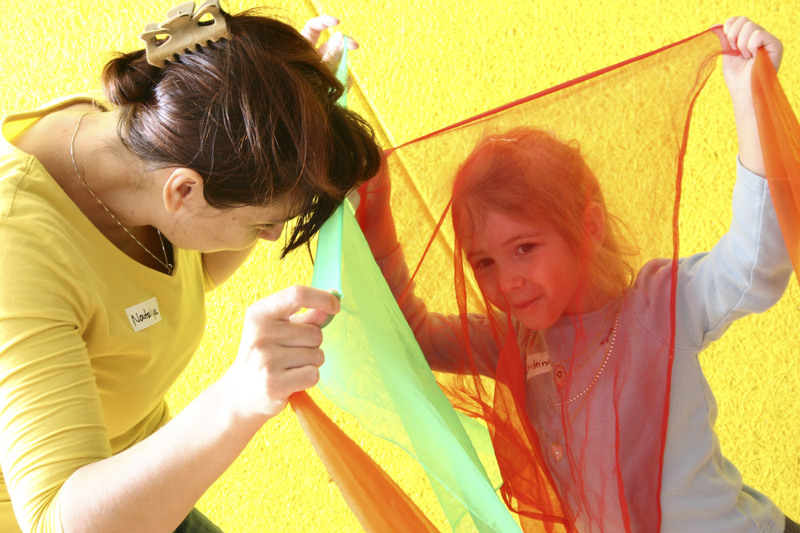 When I think of making music with young children, some of the first things that come to mind are bouncing, clapping, drumming, shaking, lively, upbeat songs and activities. While these are all valid, playful, developmentally appropriate ways to engage musically with children, lately, I find myself interested in the more mellow side. This session, I’ve been struck by the incredible focus drawn with some of the slower, softer songs. Be it the song itself, the activity, the contrast, the community, I’m not exactly sure, but I am sure there’s something special in this end of the musical spectrum. For example, “She Sells Sea Shells”, many of us agree that there is something almost magical about this song, right? In my classes it nearly always stops children in their tracks and the concentration is palpable. Multiple parents have told me stories of being emotionally moved, and that they enjoy listening to their young children play with and sing this melody. I’ve witnessed very accurate contouring and pitch from a lot of children independently singing this song. I can only imagine how much more of this happens at home! A couple of recent successes in the Drum Collection for me have been “Arirang” and “Sneak and Peek”. I’m inspired by the attention shown in the children during a very fluid, controlled, slow, Tai Chi-like movement, and a careful, secretive, rhythmic, tip-toe sneak, with singing that is barely audible. Of course, it’s not the doing it “right” that these activities are successful, or even in the “doing”. Success to me is in the light of the eyes and demeanor, the absorption and the turning wheels – that’s the language of music being unlocked. Singing or humming softly while playing or during daily activities; maybe the same song or melody goes with the same activity. Turning on classical music while awake too, not just for sleeping! Making a playlist of just laid back faves (yours or your child’s) to play in the car when the mood is right (or needs to be!). 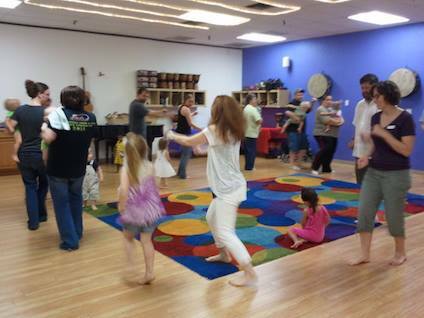 Modeling slow movement or dancing with and for your child; remember you are your child’s most important musical teacher! Using scarves or flowing fabric to show smooth rhythm visually. And of course: singing calming, soothing, bonding, bedtime lullabies!